Bungee jumping may give you great thrills, but also may leave you with great injuries. After you free fall, the bungee cord tugs you back upward with a sudden and great force. The combination of this extreme force and dangling from a cord can cause varying degrees of injuries your eyes, spine and neck that can even be severe enough to result in death. Eye injuries are commonly the result of bungee jumps because of the dangerously high increase in pressure that occurs in the eyes. When the elastic chord suddenly jerks you upward, it causes fluid to flow to your head, which results in very high blood pressure inside the blood vessels in your eyes. Your retina -- the thin layer of cells at the back of your eye that directly connects to your brain--and your conjunctiva -- the thin mucous lining over your eyes -- can be negatively affected by this increase in pressure. Injuries to these areas of your eyes usually cause temporary impairment of vision, explain Mario Cesar Moreira de Araujo, M.D. and Marcelo Riccio Facio, M.D. in a Sports Medicine article. Eye infections, seeing spots and hemorrhages may also occur. The extreme forces your body is subject to as it is pulled back upward by the bungee cord can injure the vertebrae of your spine and the delicate spinal cord that they protect. Injuries typically include compression fractures — broken bones in the spine — and herniated discs and spaces between the vertebrae. While these injuries can be healed, they can also be severe and permanent. If the spinal cord inside the vertebrae is damaged it can result in forms of paralysis and quadriplegia — the inability to move your arms and legs. Your neck is at risk during a bungee jump, and injury to it can range from mild to severe. The force on this fragile part of your body that connects your brain to your spinal cord during the final stage of the jump can be enough to strain your neck muscles, and cause pain and a temporary decrease in range of motion. There have also been instances of the bungee cord accidentally entangling a jumper's neck. When this happens, it can cut off blood flow between the heart and the brain, or strangle the jumper and make him unable to breathe. In these instances, the jumper needs to be rescued immediately to prevent death. Death, unfortunately, does occasionally occur as a result of bungee jumping. If a jumper's neck is entangled in the cord for even a few minutes, his brain cannot get enough oxygen and his injury will be fatal. Another common reason people sustain fatal injuries from bungee jumping is because the cord is too long. People incorrectly take into account the elasticity of the cord and hit their heads on the ground, dying from impact. 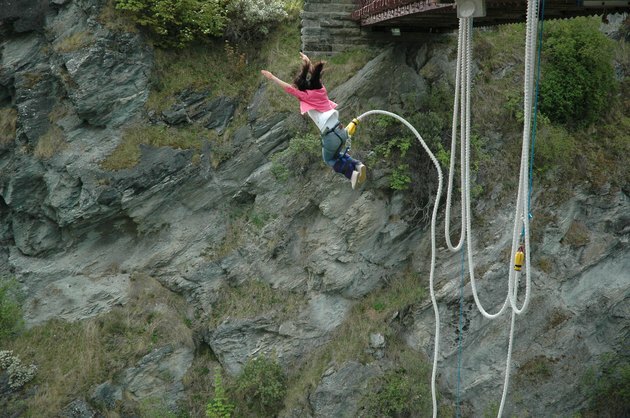 Even professional bungee jumpers make these mistakes and are at risk for fatal injuries. The day before the Super Bowl in 1997, a professional bungee jumper who was practicing for the halftime show at the Superdome hit her head on the cement floor during a jump and died from head injuries.